We went to church at Grandpa J's church today. There was a whole bunch of music time, and I like music, so that was good. I sat with Grandma C today. 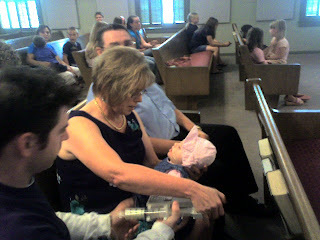 She and Uncle Ethon had to work on my feeding stuff at church because it was being difficult for them. After church, Mommy and me went with Grandma and Grandpa to Miss Cindy's house. And it is a really, really nice house. 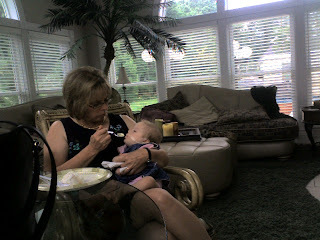 She had everyone from church over to swim and eat lots of yummy food, at least Mommy and Grandma C said it was yummy. Grandma C decided to try to give me some bananas, but they were different than my normal ones. This was called pudding, and I liked it alot. Grandma gave me enough to make my tummy full, and it was so yummy! Everyone played games for a while in the evening, so I sat with Mommy so I could watch. Then I got all sleepy and took a nap on Pop. We finally left to go home about 9:30 tonight, so it's going to be very late when we get home! I like the sleeping style she has in the last pic. Sounds good - about to head to convention center at KC. Way to go on the pudding! Let me tell ya, if you think banana is good...you are going to freak out over chocolate pudding! That is the lead in drug for ICE CREAM...my personal favorite. Once you experience chocolate chip cookie dough or cookies & cream it will be all over and you will be eating all the time. Have a fun day Braska!